1. 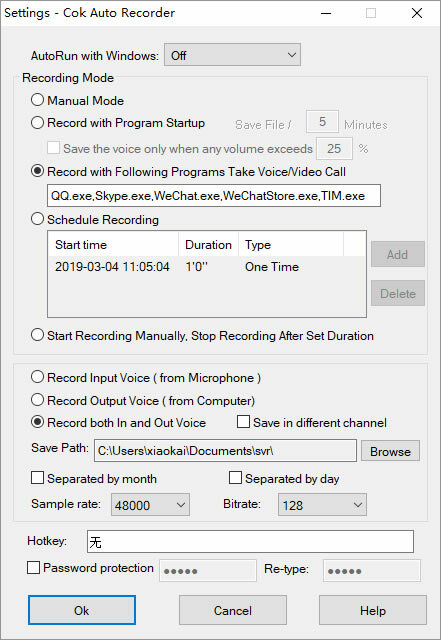 Record both sides audio when you make a audio or video call on PC chat software, Such as Skype, Line, WeChat, QQ, imo, Viber, KakaoTalk etc. 2. Record audio from your computer and(or) microphone. 3. Record high-quality music from website or any player software. Off: Cok Auto Recorder does not start automatically with windows. On - Visible mode: Cok Auto Recorder will automatically run after windows boots; and the main window will display on your desktop, a small icon will display on the lower right corner of the screen. Notice: It will also run with visible mode when you run this software by your hand. On - Invisible mode: The software will automatically start after windows boots; but the main window and small icon will not display on your desktop. You can find out the software only by pressing the hotkey. Notice: It will also run with invisible mode when you run it by your hand. Manual mode: You need to click "Start" and "Stop" button on the main window to start and stop recording. 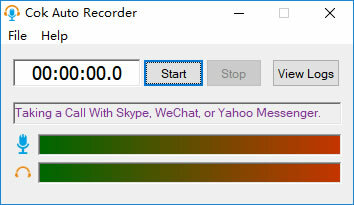 Record with Program Startup: start recording automatically when Cok Auto Recorder is opened. You need to set how many minutes each time to save the recording mp3 files. Save the voice only when any volume exceeds designated value: If you do not tick this option, Cok Auto Recorder will record every sound after it boots; sometimes we do not want the software to record when there is no/low sound around. Therefore, we have added this option in the software. For example, we set 25% in the back and the front shows to save files every five minutes. In this case, if there is any recorded volume exceeding 25%, these five minutes will be saved as a file (the color bar on top of the main screen displays the current volume of sound recorded by the microphone). Record with Following Programs Take Voice/Video Call: You need to set at the bottom the process name of the software needed to be intercepted, as separated by commas. We have set up the default processes of Skype, WeChat, QQ. If you need to set up other programs, you can add in the back, but remember to separate with a comma. Other chatting software: Right click the chatting software icon on desktop, then click "Properties" menu. You can find the process name in then end of "Target" textbox. 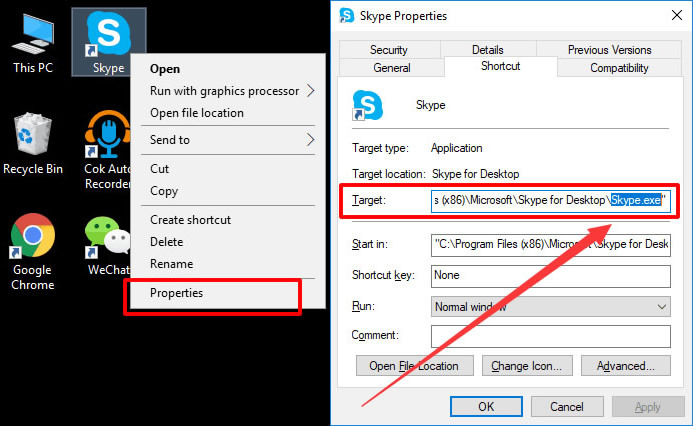 The following picture is the steps to get the process name of Skype. Schedule Recording: It will record at the set time and stop recording after set duration. Start Recording Manually. Stop Recording after Set Duration: When you click "Start" button, it will ask you to input recording time, and this recorder will stop recording after set duration automatically. Record both In and Out Voice: Cok Auto Recorder not only records audio input by the microphone, but also record sounds output from the computer. When recording voice call, generally you need to tick this option so as to record voices from both sides, otherwise it will only be able to record your own voice or the voice from other side. Hotkey: Hotkey to unhide Cok Auto Recorder.